Healthy soil teems with life—not just earthworms and insects, but a staggering multitude of bacteria, fungi, and other microorganisms. Chemical fertilizers injure the microbial life that sustains healthy plants, and the soil becomes increasingly dependent on artificial, often toxic, substances. But there is an alternative: by strengthening the soil food web—the complex world of soil-dwelling organisms—gardeners can create a nurturing environment for plants. Teaming with Microbes extols the benefits of cultivating the soil food web. 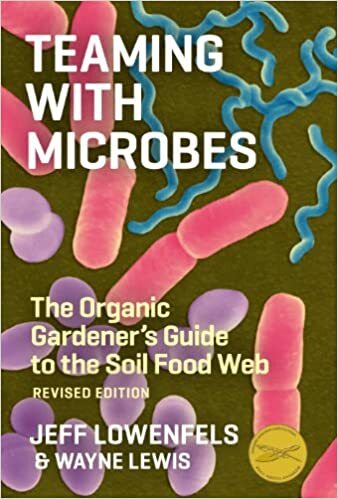 It clearly explains the activities and organisms that make up the web, and explains how gardeners can cultivate the life of the soil through the use of compost, mulches, and compost tea. With Jeff Lowenfels’ help, everyone—from devotees of organic gardening techniques to weekend gardeners who simply want to grow healthy, vigorous plants—can create rich, nurturing, living soil.